Is your hormonal IUD causing you to breakout? Due to the increasing popularity of IUDs for convenient birth control, I have been seeing more women in my office frustrated by severe acne. Many come to see me because their GP or gynecologist has told them that their hormonal IUD (eg. Mirena, Skyla) is unlikely the cause of their acne because the hormones only act locally. Unfortunately, I hear this far too often. How do hormonal IUDs work? Hormonal IUDs prevent pregnancy for up to five years by releasing a small daily amount of levonorgestrel, a synthetic form of progestin/progesterone. See the table below to see the amounts of Levonorgestrel released by various types of hormonal IUD. Levonorgestrel increases your cervical mucus so that the sperm cannot reach the egg. It also thins the lining of your uterus, making it difficult for a fertilized egg to implant itself on the wall and result in pregnancy. Skyla/Jaydess® 13.5 mg total – Average of 6 ug/day released over three years. Kyleena® 19.5 mg total – Average of 9 ug/day released over five years. 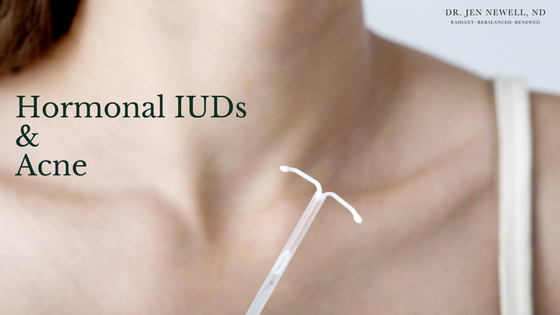 How do hormonal IUDs cause acne? Since hormonal IUDs can affect your hormones, it can cause acne, particularly if you had breakouts during your adolescent years and if you’re already breaking out before contraception. Progestin has an androgenic effect that stimulates the oil glands within the skin to overproduce sebum. Once there’s excessive oil on your skin, it can mix with sweat, dirt and dead skin cells to clog your pores leading to acne. It also has an inflammatory action on the skin leading to a greater chance of deeper, painful blemishes. There is research that about 14-15% of women who use Mirena will experience skin issues, like acne, because of the levonorgestrel hormones in the IUD. One study even suggested that the chances of breaking out with Mirena actually increases over time, particularly after 12 months of use. If you are prone to breakouts, I recommend that you talk to your healthcare provider or Naturopath about an alternative birth control method that won’t aggravate your skin. I also encourage you to consider the many other factors that contribute to acne and to take the time to get to understand your skin. Suhonen S, Haukkamaa M, Jakobsson T, Rauramo I. (2004) Clinical performance of a levonorgestrel-releasing intrauterine system and oral contraceptives in young nulliparous women: a comparative study. Contraception. 2004 May;69(5):407-12.